Angell Street near Brown University. Student housing near Thayer Street. Dumpster next to Brown University student housing near Thayer Street. Parking lot behind Brown University student housing on Brook Street. PROVIDENCE — As college students packed up to leave the city, many of their belongings ended up curbside. During the past few weeks of May, it's not unusual to see couches, desks, floor lamps and small appliances lining the curbs in front of multifamily homes. On campus, overstuffed Dumpsters outside dorms often disgorge their contents. This year, colleges and universities again rolled in huge Dumpsters to handle the overflow of trash at undergraduate dorms. 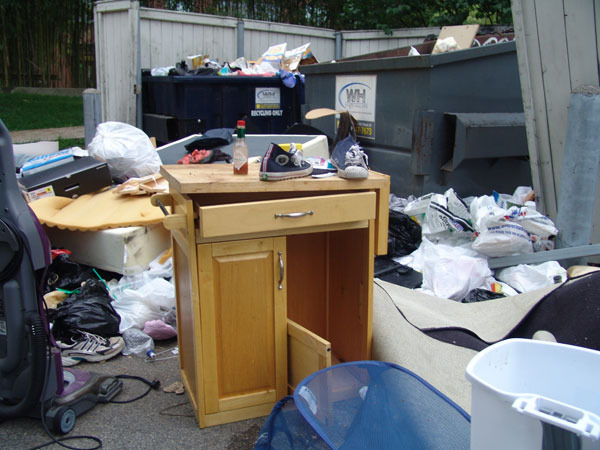 Johnson & Wales University placed three 20-yard Dumpsters behind its dorms on Pine Street. Brown University peppered its campus with Dumpsters. While sincere efforts were made by student groups to collect items for donation, at Brown University the heaping Dumpsters placed near the underwhelming donation corrals told the sad tale of a pervasive throwaway culture. There were TVs, unworn shoes and like-new clothing. By Memorial Day, scavengers — aka sidewalk shoppers — were out in force. Some patrolled the streets in pickup trucks, scooping up the jettison. Others browsed on foot and took what they could carry. ecoRI News spotted three scavengers picking through the abundant Dumpsters behind Brown University dorms on Young Orchard Street. Their work was interrupted by a Brown police officer who told them they needed to get off Brown University property because of liability issues. The Rhode Island Resource Recovery Corporation, which operates the state’s Central Landfill, told ecoRI News there is an anecdotal bump in the tonnage of trash collected in May but didn’t have any hard figures. For those who want to get their holiday shopping done early, it might be worthwhile to poke around the streets of the East Side during the waning weeks of May. There is plenty in stock, and you can’t beat the prices.